Recipes Archives - Prepare To Eat! I hope you all have had a nice weekend! It’s Sunday night here and we are getting ready for the week ahead. We have work, camps, a swim meet, swim practice, and a pool party to look forward to on Friday. 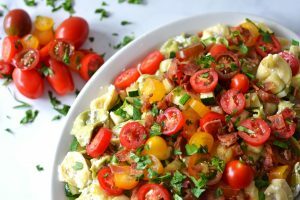 With the official start of Summer beginning a few days ago, I have the best, simplest, most delicious dinner for you to make – Heirloom Tomato & Bacon Tortellini Pasta! This dish comes together super quick, is packed with flavor (thank you, bacon) and is both comforting and refreshing. I promise it will quickly become a summer staple in your home. Hello! It’s a lively Saturday night here in North Carolina – we’ve been to Five Guys, Best Buy and cleaned out the garage – I know, I know, you’re completely jealous aren’t you? 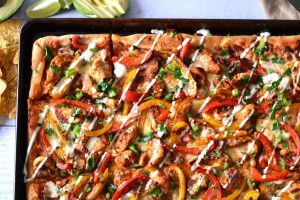 At least I can say that I’ve discovered you’re next pizza craving – chicken fajita pizza! 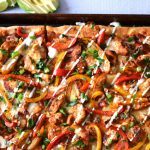 What could be better than combining fajita flavors and ingredients with a pizza? 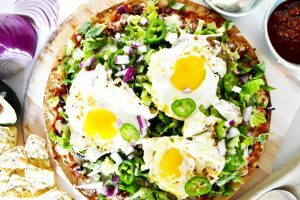 You can customize the toppings to your own preferences, think jalapenos, lettuce, tomatoes, cilantro, sour cream….or better yet, rummage around your fridge and use what you have on hand. Either way, it’s bound to be delicious. Hello! We’re acclimating to summer break over here, which so far has meant sweltering heat and figuring out which day camp my son is supposed to be at for the week. On top of that, I’ll be 33 weeks pregnant tomorrow and the heat index here in North Carolina is over 100 degrees – save me! 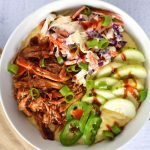 Enter these barbecue chicken grit bowls! This meal can be made in 30 minutes, requiring only one pot on the stove, and it’s downright delicious. 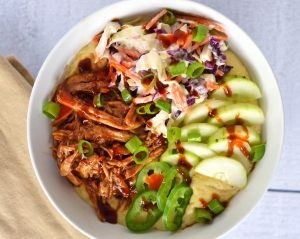 It’s creamy from the grits, tangy and sweet from the barbecue sauce, crunchy from the coleslaw and a fun surprise of quick pickled cucumbers. 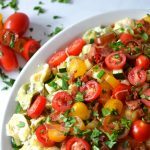 It has ALL of the flavors of a barbecue with minimal effort required – a win in my book for sure. If you’ve never made grits before don’t worry, not only do they taste amazing, but they’re easy to prepare – I promise! Happy Fri-Yay! Today was the last day of school for my second grader woohooo! Although work, sports and summer camps will still dominate our schedule – it’s nice to switch up the routine sometimes right? 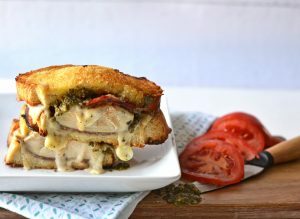 Take for example, this Italian Chicken Caprese Sandwich. Now you might be wondering – what in the world is an Italian Chicken Caprese Sandwich? Imagine taking the best parts of an Italian sub and combining them with a Caprese Salad – Boom! Mind blown right? Now imagine that you can make the whole sandwich on your grill in give or take 30 minutes. Feel free to sip on lemonade or a cold glass of wine, prop your feet up because tonight dinner is handled and it’s fast, easy and suuuuuuuper tasty. Confession: I do not like “meat sauce” when it comes to my pasta. I prefer plain marinara over meat sauce any day of the week. However, once I tried bolognese, I was hooked. Its muuuuuuch more flavorful than it’s impostor meat sauce. Instead of tasting like you added meat to your spaghetti sauce, it has it’s own, rich, deep flavor. It’s about as comforting as you can get. The one downside to bolognese though – it takes forever to cook. 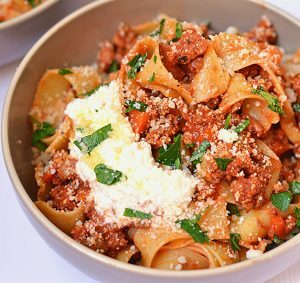 With this recipe I set out to make a lighter version of your typical bolognese using ground turkey instead of ground beef. I also set out to make it as hands off and easy cooking as possible without sacrificing any of the depth of flavor you get from a traditional bolognese. Enter your crockpot. It does the simmering for you and once you’ve got your ingredients thrown in there – you can walk away and come back to a delicious, home cooked, bolognese. Trust me, this one’s a winner. Looking for an easy way to switch up your weekly meal plan? 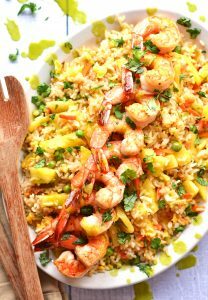 This pineapple fried rice with shrimp is easy to prepare, looks like a million bucks and brings a touch of the tropics into your life with the addition of the juicy and sweet pineapple. Best of all? It comes together in about 30 minutes – because who has hours to spend in the kitchen?! Not me! I’m off to swim team and t-ball practices these days. Last Saturday, as we walked through the parking lot on our way into the grocery store, both my boys said “Mom, Mom, Moooooom, can we get a watermelon?” They had both fixed their eyes on a large display of watermelons, and who am I do deny them the quintessential fruit of the summer? 😉 The problem with watermelons? They tend to be huge and often times there is more watermelon than anyone cares to eat. If you ever find yourself in that situation, I have the perfect solution for you. Or you might not have leftover watermelon, but you are looking for a cold, refreshing, easy, 4 ingredient adult beverage. If that’s case, I’ve got you covered too. 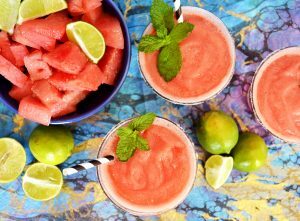 Meet my 4 ingredient Frozen Watermelon Margarita. It’s soooo easy to make, tastes cold and refreshing, and c’mon it’s summer!! Whip up a batch, kick your feet up and pretend you’re on a tropical island. My husband and kids love pizza and they love tacos. If I’m being honest, even though I also really enjoy Mexican food, sometime I just get tired of eating tacos and burritos. There, I said it – will you still love me? One night, I looked at the ingredients in my fridge and the idea for this Chorizo Taco Pizza was born. It’s Mexican flavors on top of a pizza crust, but it doesn’t feel like your eating a taco or a pizza, it’s just straight up delicious. What’s not to love? There’s a crispy crust, chorizo, black beans, lettuce, avocado, onion, jalapeno, eggs, and cheeeeeese. 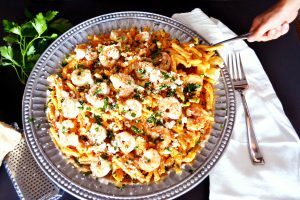 This Creamy Dreamy Shrimp & Vodka Sauce Pasta has a secret ingredient. Do you want to know what it is? The secret ingredient makes the vodka sauce extra creamy and thick, provides some tang, and is downright delicious. Ready? It’s goat cheese. Goat cheese is melted straight into the vodka sauce and trust me, it’s the way to go. I also added goat cheese as a garnish, but it’s the goat cheese that’s IN the vodka sauce that is the hidden gem. The flavor of the goat cheese is not prominent in the sauce, in fact, I don’t think you could detect it if you didn’t already know it was there, it blends beautifully with the flavor of the vodka sauce. We have even gotten to the fresh tomato flavor yet. Are you ready to get cooking? This dish comes together quickly and has outside dinner party written alllllll over it. You guys, I am obsessed with these brownies!! 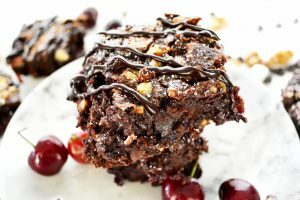 In fact, I may have eaten half the pan myself……I call these Everything But the Kitchen Sink Cherry Brownies, because they have a lot going on, but the main star (aside from the brownie base of course) are the cherries! I oven roasted fresh cherries so they are tender, juicy, and a little flavor punch to an otherwise dense and chocolaty brownie. I then added marshmallows, walnuts, and chocolate chips. The top is finished off with a chocolate glaze and mmmmmmmmmm it.is.perfection.